What do you get when you combine six smart phones, a one-of-a-kind camera jig, and about a week’s worth of post-production time in the editing bay? Head over to the Xperia Studios’ Web site (link at bottom) to see for yourself. Xperia Studios is a division of Sony, where the electronics brand showcases cutting edge experiments carried out with mobile phone technology. In this case, panorama photography specialist Joergen Geerds paired up with mountain biker Mark Sevenoff. As the owner of Western Spirit Cycling Adventures, a touring company based out of Moab that leads mountain and road bike tours in some of the best riding locales in the world, as well as in their own back yard, it would be hard to find a more knowledgeable, test pilot for this experiment than Sevenoff. Geerds fabricated what he calls “an extruded layer cake of plastic” in order to hold six fisheye-lens-equipped smart phones in a 360-degree array (Click through for a YouTube videoshowing how the cameras were assembled). 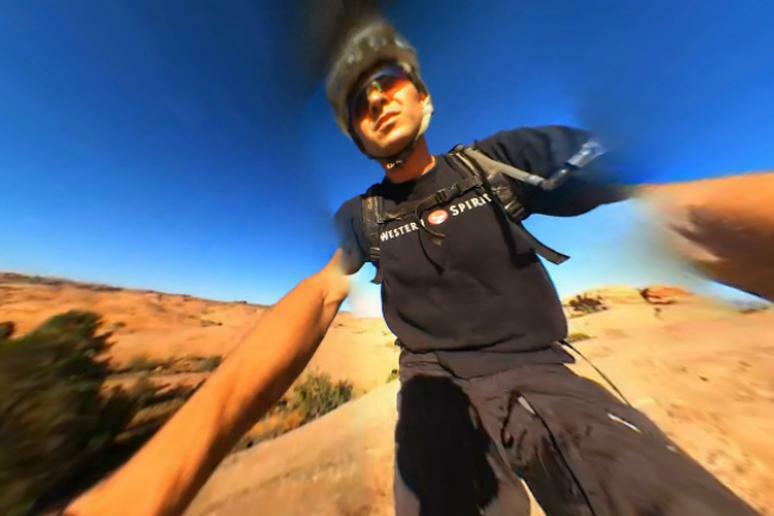 He then mounted the contraption onto Sevenoff’s handlebar for a blast along one of the most famous, and arguably most unique mountain bike destinations anywhere: Moab’s Slickrock trail. Marketing coup for Sony-Erikson? Maybe. Worth watching? Decide for yourself.